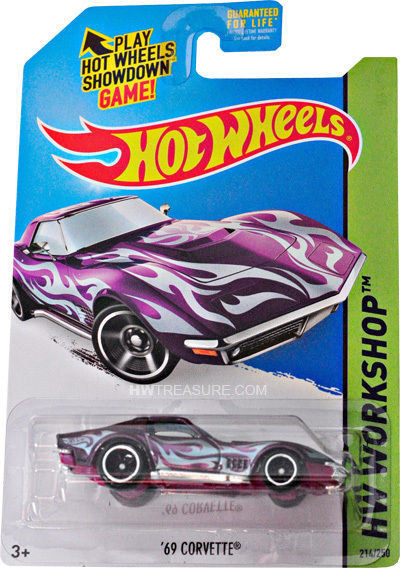 214/250 is part of the HW Workshop series and the 2014 Super Treasure Hunt set. The Spectraflame purple Vette is covered with light blue tribal flames. The sides have the Hot Wheels logo and “TH” is on the trunk. 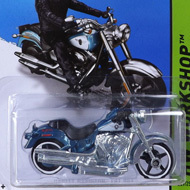 It has light blue tinted windows, a chrome interior, Real Rider 5-spoke mag-style wheels with black spokes and chrome rim, and a purple plastic Malaysia base. The Corvette made its debut in the 2006 First Editions series and is based upon the actual vehicle. It previously appeared as a regular T-Hunt in 2012.